The Pretend Texas Farmer | I am not a farmer, but I like to eat like one. Why the absence? Well, besides me being extremely ADD, always seeking some kind of new diversion and quickly forgetting the old, I decided to teach American Literature to 10th graders at a private school for the last two years. I thought that I would have time to write but I was so wrong. I have moved on again, this time helping my husband in our real estate investing business. I am curious to see if I would ever want to write about that experience, but I stalled getting into it precisely because real estate seemed so boring, so I am not sure if writing about it could hold my interest. What I do love about investing is that I can and did make close to three times my yearly teaching salary (ok, it was small) in only one transaction. And I also have more time to do the things I really enjoy doing, which brings me back to this blog. Except now things have really, really changed in my cooking world. I had always eaten gluten-free, which seemed restrictive but now seems like a veritable buffet of options, considering that I have had to eschew a large majority of foods due to the onset of an autoimmune skin condition. I really have put the skin condition into remission through diet (a stricter version of paleo), but I am just now coming to grips that I may be on this restricted diet forever. Forever. Thankfully, I have always loved fresh vegetables, so much of what I cooked and wrote about before still stands…minus dairy, grains, nuts, seeds, eggs, tomatoes, eggplant, peppers, etc., etc. I DID say it was restrictive. My new diet’s official name is the Autoimmune Protocol (or AIP), championed by PaleoMom and others fighting autoimmune conditions. For a foodie, the restrictions sound miserable, but for me, all I had to do was google pictures of advanced stages of my particular condition (Hidradenitis Suppurativa…don’t google…I warned you) to be motivated to stick with it. So, until something drastic changes, all recipes on here will be AIP-ish (I have added back in some non-AIP foods with success), but hopefully it won’t be too noticeable, as it all centers around locally grown food in the first place. AIP-friendly tacos. 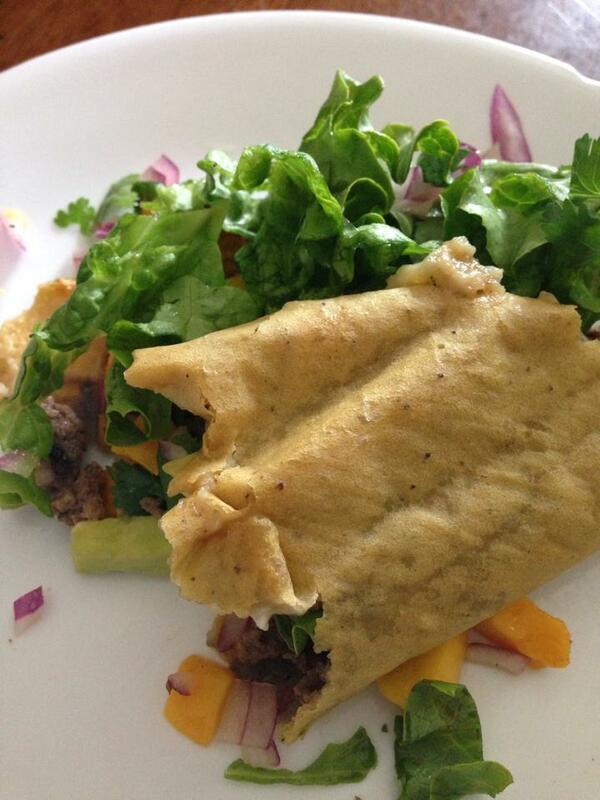 That’s a plantain wrap holding it all together. It’s no secret that I love fall. So part of my culinary mission this time of year is to incorporate as many fall ingredients into my menu as I can. This often translates into taking old favorites and re-inventing them. I grew up in San Antonio so my default food is Tex-Mex. The trio of hot peppers, cool cilantro, and the bite of white onions can do no wrong, in my opinion. So how to combine the flavors of fall with Tex-Mex? The 6 tomatillos included in my CSA share this week were begging to be made into salsa. I also had a lovely red kuri winter squash in my pantry. A few weeks ago, I roasted another red kuri, which made a beautifully orange-tinted mexican chicken soup (which I intend to post soon). The roasted kuri had such a nice, smooth texture that today I began to think that perhaps the squash could act as a stand-in for refried beans. A winter squash chalupa. Hmmm…this just might work. The results? Very different, but surprisingly fresh and addicting. The squash adds a sweeter taste than beans, but the tomatillo salsa balanced out the sweetness nicely. I was frankly delighted to find another way to use winter squash. My two taste testers, my preschooler and my fourth grader, gave it their marks of approval. My three-year-old, however, ate hers with squash and meat only. Preparing the squash: Cut your squash in half and place cut halves on a roasting pan, skin side up. Prick a few times with a fork and roast at 375F until tender. If you use a red kuri, check after 3o minutes. Cool and mash with salt and pepper. While you are waiting for the squash to roast, you can start preparing the rest of the chalupa ingredients. There are lots of recipes for tomatillo salsa, but they almost always require cooking the tomatillos. I had thought for a long time that tomatillos had to be cooked, but a Rick Bayless recipe proved otherwise. He gave the option for cooked tomatillos or using them raw. When cooked, the tomatillo changes from fresh and “green-y” tasting to a sweeter, sour flavor. I prefer the fresh, raw taste. And, as usual, I adapted the recipe to increase the onion and cilantro, just because those two ingredients make me happy. Put all of the ingredients in a food processor and pulse until finely blended. Turn on the oven to broil. Brown the beef in a frying pan over medium heat. When browned, add the spices and salt and stir for one minute more. Add 1/4 cup of water and turn to low. Simmer until tender, about 10 to 15 minutes more. You may need to add more water but the point is to end up with a moist, slightly saucy ground meat. Take each chalupa shell and spread a layer of mashed squash. Top with cheese and then the ground beef. Put under the broiler until edges are crispy and the cheese is melted. Watch carefully for burning! Top each chalupa with sliced cabbage and tomatillo salsa. Make just before serving, as the squash will make the chalupa shell a little soggy if it sits for too long. Let’s face it. Locally grown fruit is one of the harder things to find in Houston’s farmer’s markets. I check the harvest calendar periodically to see what I should be looking for, and November lists fruits like apples, pears, persimmons, figs, and melons. That’s wonderful, but where are they? Melons I still see at the markets, but apples? No. Satsumas. Satsumas are a type of mandarin orange. They are sweet, seedless, and super easy to peel. Known to be one of the sweetest of the mandarins, they almost melt in your mouth. Typically they are sold with the stems attached. These were not, so I was hoping that I wasn’t buying some less desirables ones. It turned out these were sweet and just right. Satsumas grown on the Louisiana and Texas coast seem to be different from ones grown in California. Here, the skins are literally falling off the fruit. If you read up on Satsumas, it is suggested to choose “tight skins.” Not possible with these. Just use the obvious tests when selecting – no dark spots, pick the heaviest ones. They will be greenish this early in the season. That is expected. I would never need a recipe using a satsuma. Fruit like this just doesn’t make it past the eat-out-of-hand stage for me. Yet, I was curious. So I googled. I found this one mentioned for clementines over and over, so I thought I’d link it here, especially as it is a flourless cake as well. Why not use Satsumas instead? I think my curiosity may get the best of me here. I can imagine this might make a refreshing Christmas cake. I happened to have some sweet potatoes I bought at the Sugar Land Farmer’s Market from a few weeks ago. Sweet potatoes are so kind that way…you don’t feel the timer ticking down on them like greens and eggplants. Usually I roast any vegetable when I can, but there are a few recipes where I really don’t want the deep carmelized flavor. Sounds crazy, I know, but boiling is just right to make a sweet potato mash. Even my kids love them this way, if I don’t go too crazy with the peppers. It's all in balance...sweet, salty, spicy. Chunk the sweet potatoes and add to a medium saucepan of salted water. I keep the water level to just above the sweet potatoes, so the flavor doesn’t dilute too much. Add the whole peppers and bring to boil. When the potatoes are tender, add the cilantro and turn off the heat. After the cilantro wilts a little, pour off the water. Add the butter and blend with a hand mixer. I suppose you could hand mash the potatoes, but the peppers break apart and distribute so nicely with a mixer, I’d go to the extra trouble. Taste and adjust the butter and salt as needed. Top with a slice or two of the pepper to serve as a warning to the diner of delicate palate. Baby bok choy, toasted almonds, oranges. Last Friday kicked off the first delivery of my fall CSA season. It’s been so strange reading other blogs around the country that talk of their CSA season coming to an end. End? Really? We’re just beginning here. I have nine more weeks to look forward to! My share this past week had garlic chives, french breakfast radishes, various hot peppers, a huge bag of arugula, okra, baby bok choy, and purple long beans. I’ve had a heads up that baby bok choy will be included this week as well. We were also going to get sweet potato greens too, which I love, but a freakishly early frost killed them overnight. Oh well…such is the risk with a CSA. The baby bok choy was lovely–so lovely I didn’t want to cook it, even though I usually can’t resist the way the white parts deliver a watery crunch when sauteed. I wanted a salad, but I didn’t want it stereotypically Asian, with a heavy soy-sauced and overly sweet dressing. I remembered the orange olive oil and orange infused white balsamic vinegar I bought recently from Texas Olive Ranch. The dressing ended up with a splash of tamari, but it really just provides a balanced saltiness for what could be overly orange-y. Segment an orange, toast some almonds, dice some onions (I only had white, but green would be better), and that’s that. You might see a radish sticking out in my pictures. I couldn’t resist. Toss together the bok choy, onion, and orange. Pour dressing over the salad. Right before serving, mix in the toasted almonds. The bok choy is sturdy and this can sit awhile without becoming soggy like normal cabbage. You may even prefer it wilted a little. But do save the almonds until serving! Few foods symbolize a season like the winter squash. As soon as bright orange pumpkins and deep green acorn squashes dot the markets, our wardrobes are suddenly given permission to take on the same fall colors despite the thermometer reading. Granted, here in Texas the summer squash hangs on well into fall, but no matter. Just seeing the hard, fat little orbs of dense squashiness has me thinking of all the ways to welcome autumn to my palate. The irony of the name ‘winter squash’ has not escaped me. I am assuming the fall-harvested squashes received their name from their blessed ability to keep over the winter. I can only imagine how extremely valuable they were in winters past, before electricity and cold-storage came along. In fact, the name “keeper” is added to some varieties, touting their ability to hold for long times in storage. I bought a variety new to me from Stacey, called a “Taiwanese Keeper.” Stacey usually only plants heirlooms, so I wanted to compare this squash, which looked very pumpkin-like in shape, although not in color, to a store-bought “Pie Pumpkin.” These are the smaller pumpkin variety usually sold in the store as a cooking pumpkin, as opposed to the bin-sold jack-o-lantern types. I was going to use just two methods…oven roasting and grilling. I think steaming and boiling dilute the squash flavor, not to mention bypass the opportunity to carmelize the naturally present sugars. Sliced for the grill, awaiting olive oil and salt. a) Use a sharp knife. Ugh. I had to use too much force (my fingers are still here – yea!) and my slices were horribly uneven. There is more than aesthetics at stake here. It means that the slices are going to cook unevenly on the grill. So if you decide to grill your winter squash, using a sharp knife might keep you from a trip to the E.R. b) don’t start a project like this when you promise your kindergartener that you are going to meet her for lunch. My squash was not ready when I noticed I was already late, so I had to make the unproven decision to move the squash away from the fire and hope that the indirect heat for 30 minutes was not going to ruin it. c) if using a traditional grill, be sure and build your fire broadly. I am sure there is a better way to say that, but what I mean is think about the space required to spread out the squash. I made my fire with the image of the intact squash in my mind, forgetting how much space rings of squash would need once spread out. This forced me to overlap some…not desirable. With these lessons learned, here is the method: Prepare your grill for medium-high heat, using the 3 second test. (The heat is about right when you can hold your hand above (not on!) the grate for about 3 seconds comfortably.) Slice your squash into 1 inch slices, brush with olive oil and sprinkle with salt. Oil the grill and lay slices directly above the heat. Flip after 5-10 minutes. (Note: I could not find a consensus on time…I read everything from 5 minutes per side up to 30! I think the reason for this is that each squash is different. My pie pumpkin slices were ready much sooner than the keeper.) Continue to grill until tender and nicely carmelized. Results: America’s Test Kitchen I am not, so my methods weren’t perfect, but I was really happy with the way the keeper turned out. I’m not sure exactly what the results would have been if I did not have to move it off of direct heat during my 30 minute kindergarten lunch, but what did turn out was perfect for cubing. It made about 5 cups of cubed squash. Lightly smoky, not overwhelmingly so. Gently carmelized on the outside. Firm, yet tender. The pie pumpkin did not, as expected, stand out with this method. The Oven: I’ve seen people roast whole, sliced and halved squash for the oven. I think your method will depend on how you want to serve it. I had puree in mind, so I just halved the pumpkin, minus a slice or two from the middle, scooped out the membranes and seeds, and put the cut halves face down on an oiled cookie sheet. Had I wanted oven roasted squash for a side dish, I would have sliced, oiled, and salted the squash. I can’t think of a single reason I would want to roast one whole. Besides, you can’t roast the seeds that way! Preheat your oven to 400 F. Roast the halves face down for 45 minutes up to an hour or more. You want to see a nice, brown, carmelized bottom when finished, and the tops will look collapsed. Scoop out the cooked flesh when cool enough to handle. Results: The pie pumpkin didn’t need pureeing at all. Very smooth and sweet. The keeper had a stringier, dryer texture, similar to a spaghetti squash, but when pureed in a food processor, it became silky smooth; not as sweet as the pumpkin but very mild and slightly butter-y. The pie pumpkin lived up to its name…perfect for a smooth pie. The keeper would be best as a pureed side dish or in a bread. I was amazed at the yield of the keeper, too. The top third made 2.5 cups of puree. The pie pumpkin only yielded 2 cups. Conclusion: The method you choose should have the end result in mind. If you plan to use the squash as an eye-appealing side or in a savory dish which requires a second cooking, such as a white sauce lasagna, the grilling method will suit your purposes splendidly. The squash will be tender yet still retain its shape. I would also choose this method for a cold salad or quesadilla. For desserts and purees, the oven method will work best. The squash breaks down into a creamier texture and the deeply carmelized flavors will add a sweeter touch.